First, I want to say thank you for all of your incredibly sweet comments on Lillie's birthday post - they meant so much to me! Second, after a month of very few pictures of Lillie on the blog I am about to bombard you with a second post in row full of pictures of her - sorry! I finally got my Christmas card picture, although it was definitely not what I had planned on - haha! Dana made a new knit hat to sell in our Etsy shop and gave one to Lillie for her birthday and I decided to attempt to take a few pictures of Lillie wearing it so we could list it. Lillie was still wearing her super tacky neon green TinkerBell pajamas that she adores so I just switched out the top for a white shirt and let her keep the bottoms on which she was quite happy with (thank goodness for photo cropping! ), and then put the hat over her crazy morning hair, popped her in her window seat with her stuffed animals and didn't figure I would get anything good but thought I could hopefully get one or two semi-usable shots so we could at least put the hat for sale. I actually ended up getting a couple I really liked and am now going to use one of them for the front of our Christmas card. That's always how it is - I spent two weeks trying to set up the perfect shot in Colonial Williamsburg and had zero luck and then in two minutes with her still half in her pj's and super messy hair hidden under the hat, got one I liked a ton better- haha! She still isn't smiling but I have given up on that - maybe next year! This shot shows the true red color of the hat which we will have for sale when we reopen on December 12th. We plan on having a very limited number ready to ship so that they will arrive in time for Christmas. We didn't do much for Lillie's birthday on Wednesday but we did squish in having some cupcakes from Coldstone and letting her blow out her candles when Jon came home to change into his suit before heading back out for his game. It was so cute - as he was getting ready she informed him "Daddy I ready....Daddy I ready too!" We told her last game she couldn't got with him and had to wait and go with me because she wasn't ready so I think she thought if she was ready this time she could go ahead of time with him. Whoops - I guess we will have to be more careful now when we tell her stuff like that! She was so disappointed when she didn't get to leave with him. My cousin Tamara came to visit so she went with Dana, Lillie and I to the game which we won - yay! We had a comfortable lead most of the game so it finally was a nice non-stressful game to watch and the team played so well! And then after the game Lillie got to enjoy her favorite part of running around the court with Kyla and dancing with the mascot so both she and Jon (thanks to the win) were happy campers! We will miss their next game which is tomorrow because we will be in NH but look forward to watching it on TV. 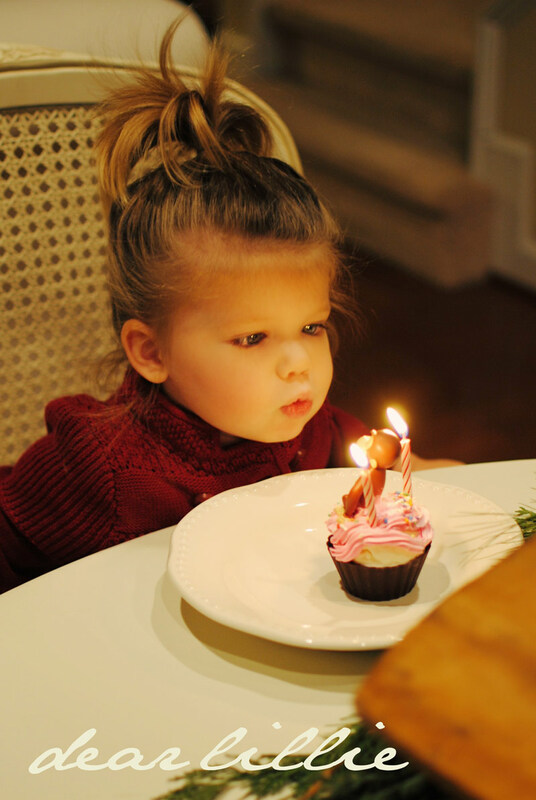 Here she is blowing out her Curious George cupcake. ﻿I hope you all have a most wonderful weekend! I love 1 or 3 the best- I think I'm with Jon on this one as say #1 because she's looking right at you and her eyes are stunning. i am for #1 or #3! so pretty in the red and white colors for christmas, although i do love me some vintage! just stands out better this time i color! funny how we go for the perfect shot and we get it when we aren't trying to hard! that is definitely how i got that blog header of my kids (the old one that was up)! totally last second, took a few pictures and saw that one and thought, that is it! was't really trying to hard, it just happened and it rarely happens with the two of them, just wait, you will see! glad lillie had a wonderful birthday! she looks adorable as always! These are beautiful! I love the color in #1! I am so jealous of Lillies hair, I have an almost two year old and her hair is barely coming in! I am definitley in for one of the red hats!! We are taking our daughter Hayden to the VCU vs WM tomorrow (I am a VCU alum) hoping for a good game!!! Have a great trip to NH! Wow those are so pretty! Your little girl is beautiful! I really like #3. The vivid red is just so perfect for Christmas! I'm a fan of #1. Lillie's eyes are just SO striking! I love the new hat and you're right, these pictures turned out great! I like all of the Christmas cards, but my favorite is the 3rd one. I don't think we know each other, but I have lived in Williamsburg my whole life. I didn't go to W&M, though it is a beautiful campus and I love going to the CW area! It's so pretty this time of year isn't it!? It's funny, I stumbled upon your blog having no idea you were from my area! Then I starting seeing familiar sights in your pics so I was so excited to find out you were from my area! small world! Jennifer! I'm pleased to tell you that I nominated you & your fabulous blog for the "Stylish Blogger Award". I'm a fan!! Please pop over to learn more. Well, she looks gorgeous! Those eyes and lips kill me! And I think that we all over use the word vintage nowadays, hee hee:) Hey, vintage is big right now! if we're voting I like the first one best also. I'm with Jon. and I just love Lillie's pouty lips! I say #1! OOOOOOOOOOHHHHHHHHHHHHHHH she is a BEAUTY! Her lips are to die for!!!!!!!! HUGS! I love them! She is so darling and I think #1 is great because she is looking at the camera...but something about the composition of #3 is just stunning. So it has to be my vote. Love the pictures!! Going with Jon-boy on this one, I like #1 best, although I really love all of them! I like either number 1 or 3. Love your blog. You are an inspiration! I like the first one the best too! OMG, the pic where she is looking directky into the camera is just breathtakingly beautiful! One of the most gorgeous baby girls I've ever seen. I love the pics! 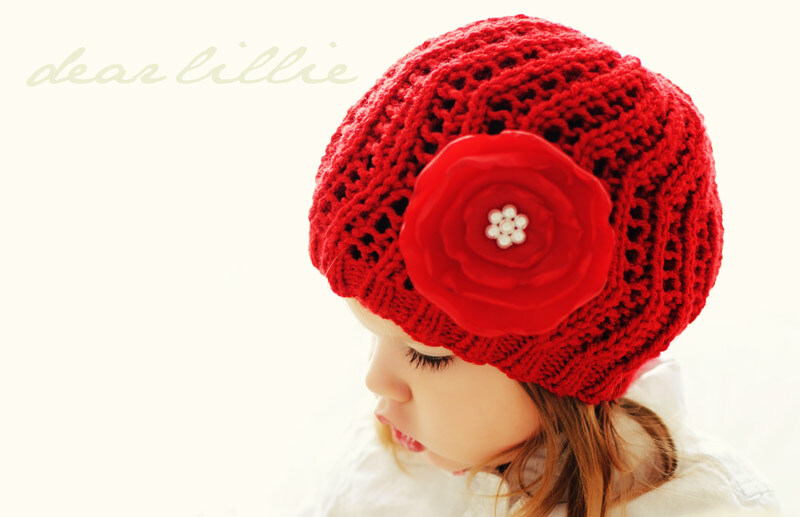 Dana, the red hat is so cute! I really couldn't choose between 1 and 3, they are both too cute! I had fun with you guys the other night! Hope you are having a blast in NH! Give everyon hugs for me. love ya! it's a tie for me...the first and second are too perfect. i am a huge fan of black and white but the color version shows off her eyes. These pictures are just perfect! She looks like a little doll! I love all the pictures and cards, but the number one card is just gorgeous! Her lips!!!! I love those lips!!!! Love the photos, and the black and white is my favorite (which is funny because I usually don't say that). I can't wait to see the store when it opens again. I noticed in your last post that you guys have the same school colors as my alma mater. We like to say that "heaven is green and gold." Beautiful! I like the 3rd one best. I like that it's unexpected and a non traditional pose for a Christmas card. You could even get extra fancy and add the picture of her looking in the inside. Whatever you decide it will look fantastic! Are you kidding me?!?! HOW do you choose??? They are ALL GORGEOUS!!!!!! Hi, I just stumbled across your blog by accident and oh, I wish I had all day to explore it! I could lose myself for hours in your beautiful photos. Anyway, Lillie is just beautiful, and if you're still looking for votes on the cards, I'd say picture number 1 (colour) with the first Noel hymn on it, because Lillie looks like a little angel. and you can mail one to me in Canada! Ok...so I'm a bit late seeing these but I have to go against the flow and say #2! I just love the emotion in a b&w. I would probably do the b&w with the Silent Night wording! All are lovely though! Which did u choose?